Ramnath Goenka, or RNG as he was popularly known, redefined what it meant to be a newspaper baron. A man of many parts-freedom fighter, Gandhian worker, politician, merchant, industrialist-he made it his mission as a publisher to empower the citizen and hold the ruling classes accountable, often at enormous cost to himself. 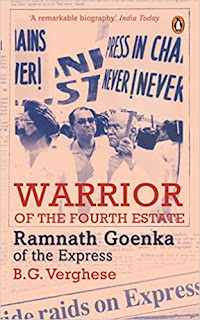 Goenka was a fearless agent for the freedom of the press, and famously waged an epic battle of defiance against the government during the Emergency. B.G. Verghese's biography charts the tumultuous course of Goenka's life, from his modest beginnings to his building of the vast Indian Express empire with its multiple editions. 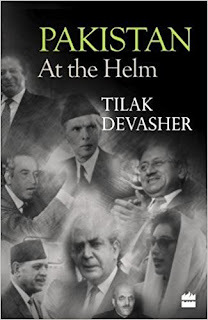 It also paints a compelling portrait of a man who was a bundle of contradictions, who had staunch admirers as well as bitter enemies, a man you could love or hate but never ignore. 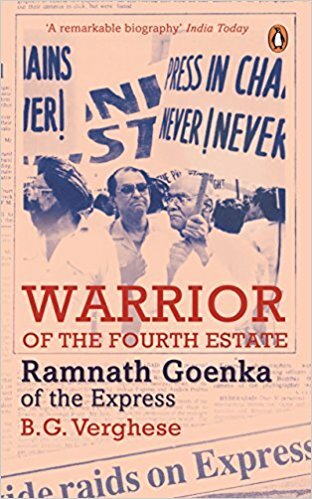 This book is a roller-coaster ride through the twists and turns of Ramnath Goenka's fortunes, including scandals and scoops, fiery public campaigns, dramatic court battles and the making and unmaking of political leaders and governments. Along the way, it tells the story, too, of a newspaper. B.G. Verghese (1927-2014) studied at Delhi and Cambridge universities and was a columnist and author. He served with the Times of India for many years before becoming the information adviser to Prime Minister Indira Gandhi. He was later the editor of the Hindustan Times (1969-75) and the Indian Express (1982-86) and was with the Centre for Policy Research, Delhi, thereafter. 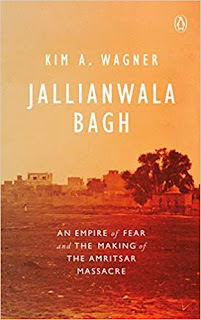 His books include Waters of Hope, India's Northeast Resurgent, Reorienting India: The New Geo-Politics of Asia, First Draft: Witness to the Making of Modern India, A State in Denial: Pakistan's Misguided and Dangerous Crusade, Post Haste: Quintessential India and Breaking the Big Story (edited). Verghese was active in the fields of education, population, human rights, the environment, regional cooperation and security. He was a member of the Press Council and chair of the Media Foundation. He received the Magsaysay Award for Journalism in 1975.